The 4-1-1: Echo Park has a very long and colorful history. Back in the day (and by back in the day, I mean the 1870s), it was originally built as a reservoir to supply drinking water to the city’s residents. It got turned into a lake, which was then used in a variety of films—like Chinatown—in the early 1900s. Later on, the park started to go into decline, but a $45 million renovation in 2013 has restored its original beauty. I’ll Be Back…: To explore the tiny island in the middle of the lake! With summer and gorgeous weather just around the corner, who wouldn’t want to be out on a lake, leisurely, enjoying picturesque views, cool breezes and the gentle kiss of the warm sun? 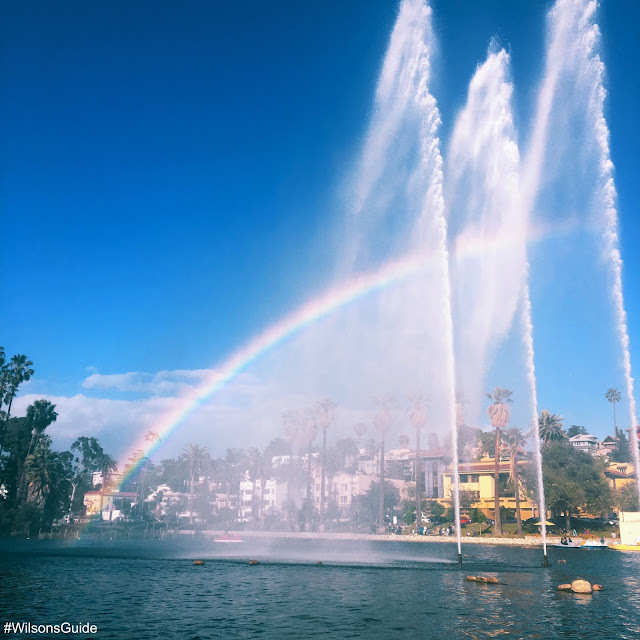 Fortunately, you can experience all of that at Echo Park Lake! 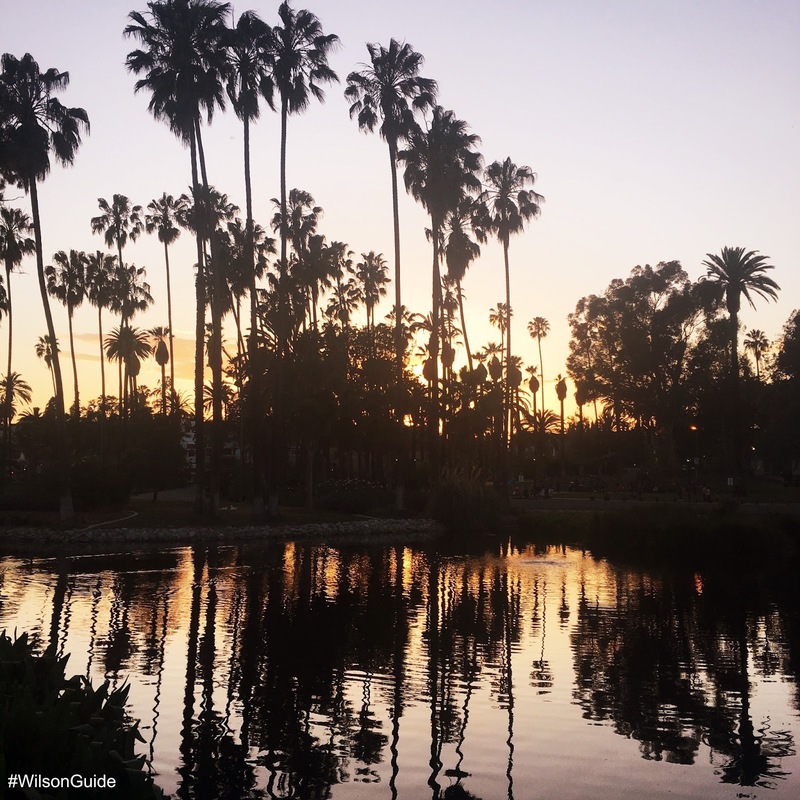 One of L.A.’s oldest parks, Echo Park spans about three miles, and smack in the middle of it is a massive, man-made lake. 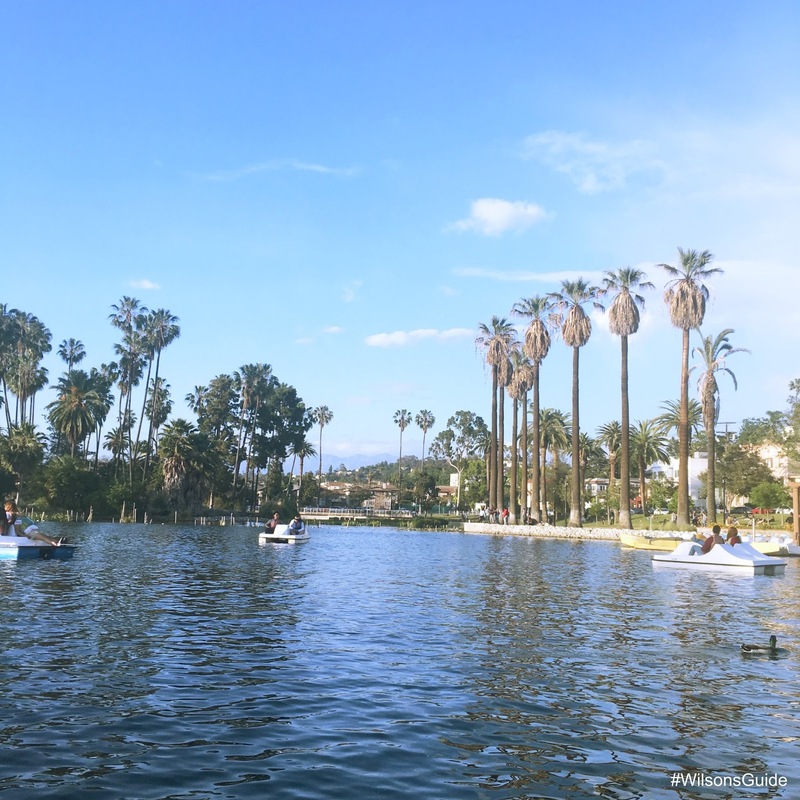 Visitors can rent out pedal boats from the Echo Park Pedal Boats Concession. The company advertises on its website that guided gondola and canoe rides are available, although I didn’t see anyone out in these types of boats, when I went. Most people were just in the pedal boats. Advertisements state that there's a one-hour time limit for rentals. Fortunately, the policy seemed pretty lax when I went, which is nice, because there’s so much to take in while out on the water. There are breathtaking views of downtown to the south, the massive San Gabriel Mountains to the north and quaint Spanish-style houses situated on the nearby hills, overlooking the park. And now thanks to the renovation three years ago, the lake has been transformed into a beautiful wetlands oasis. You can pedal by reeds, restored lotus flowers and other water plants that line the outer banks. It’s also not uncommon to catch glimpses of wildlife, like cranes, geese or ducks, such as the family of ducks I saw, pictured below. One tip of advice: be prepared to potentially get sprayed with water, when you're on the pedal boats. 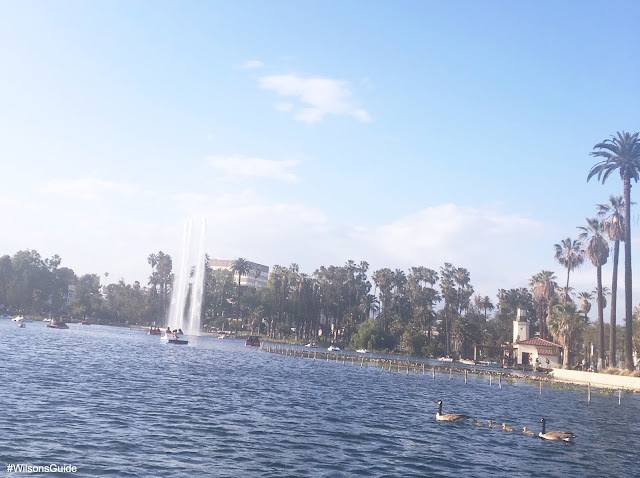 Three massive sprouts in the middle of the lake, pictured below, shoot water hundreds of feet in the air, and the wind can sometimes carry showers several feet away. Before and/or after heading out onto the water, make sure to check out the handful of vendors in the park, selling everything from tasty snacks to jewelry and trinkets. 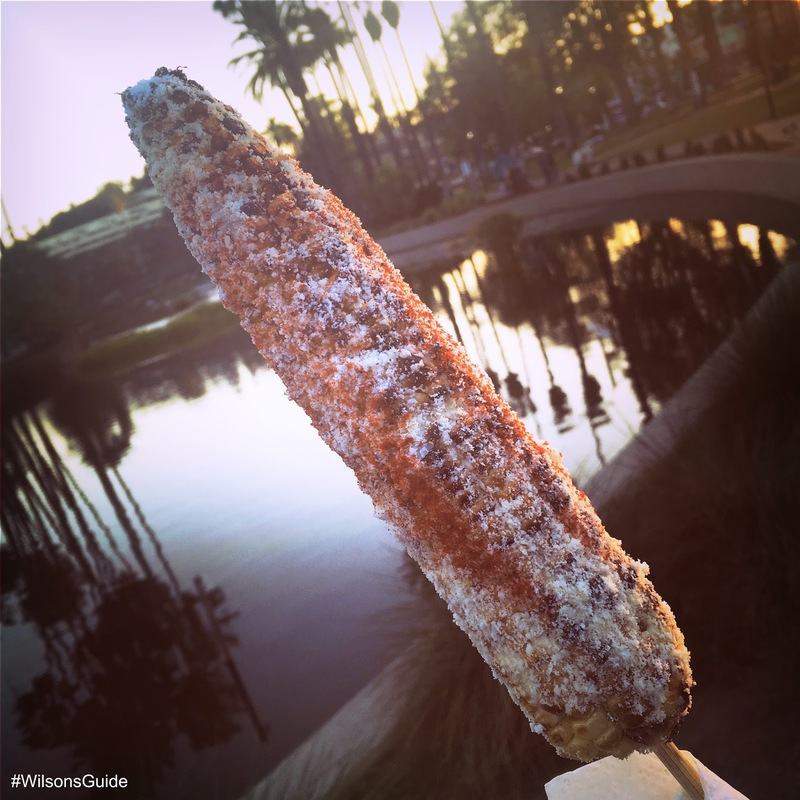 I tried elote – grilled corn drizzled with mayonnaise, lime juice, cojita cheese and chili, pictured below. A café in the boathouse in the park also sells snacks. Or, you may want to bring a blanket (and a picnic basket full of goodies?) to sit on one of the park's grassy knolls and take in the sights of the day. The next time you’re looking for a fun, relatively inexpensive outdoor activity, suitable for all ages, that includes being out on the water and still taking in the city's marvelous urban sights, I recommend spending an afternoon at Echo Park Lake.